Most people have trouble dealing effectively with discontent. 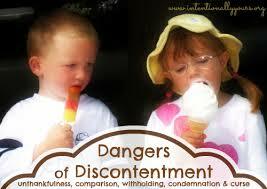 The temptation is to “kill the messenger” (the person or circumstance) that is bringing the discontent to surface. For example, some of our…how can I put this…”unusual” relatives that come knocking every Christmas. Our wrong response to discontent manifests itself in a number of ways: playing the blame game, giving the silent treatment, criticizing, complaining (and if that doesn’t work–complaining louder), gathering up our “toys” and leaving, stone-walling, bailing out, and a dozen other negative and unproductive responses. First, when feeling discontent, ask yourself why you really feel like you do. Discontent is often like people winning the lottery—most of them crash and burn as a result. It was not the fact that they won a lot of money; it was that the money allowed them the luxury of really revealing their character. Discontent is the same way. The person or circumstance that is causing your discontent right now is probably not the real problem—the issue is usually much deeper than that. If you’ll take the time to do your “heart-work” (homework) actually, the surface reason for your discontent can end up being a blessing. The second thing to do when discontented is determine how you can respond to your discontent in way that is constructive and beneficial. What good is shooting the messenger? All you’ve got now is more unhappy and discontented people. Remember, the discontent you feel is an opportunity—an opportunity to do some heart-work and really improve your life. The ONE THING when feeling discontented is—cool your jets and do some “heart-work” (see above); it’s a lesson worth the effort. Tags: Discontentment. Bookmark the permalink.